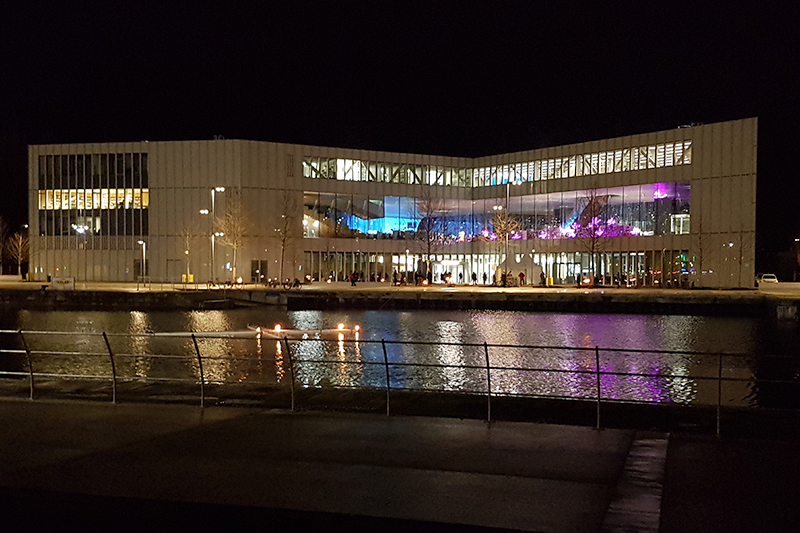 After three and a half years, the new state of the art Alexis de Tocqueville library in Caen was inaugurated in early 2017. Designed by famous Dutch architect Rem Koolhaas from OMA, the building, shaped like a St Andrew’s cross, hosts over one million art works and is organised around four themed areas: Arts, literature, sciences & technologies and human sciences. With a total area of 11,700 sqm (including 5,800 sqm open to the public), this new flagship cultural centre hosts an auditorium for conferences, exhibition venues, reading rooms, a restaurant and a café, as well as administration and preservation areas. dUCKS scéno – an agency specialised in scenography design for theatres, concert halls, museums and exhibitions, as well as special venues – created the backdrops for the various spaces. The company has worked with major architectural firms on the scenic conception of milestone projects such as the Lyon Opera, the Hanover Expo 2000, Madrid’s Reina Sofia museum auditoriums and the Fondation Louis Vuitton in Paris to name a few. 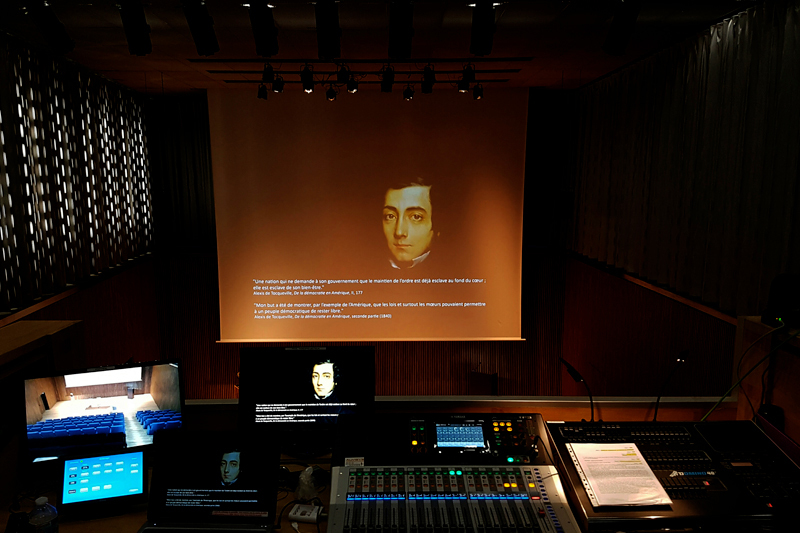 For the Tocqueville library project, they deployed the equipment used in the various areas’ scenic layouts, including AV, lighting, the video wall projection, and the auditorium’s scenic machinery. 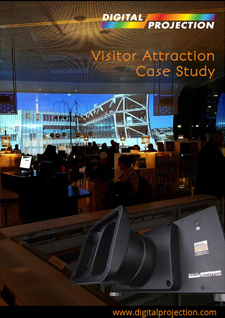 AV integration was handled by Auvisys, a Caen-based company specialised in museums, events, education and meeting rooms, who won the tender from the urban community of Caen la Mer. “We completed this project in two months on top of the cabling and networking work” explains Christophe Vallée, sales manager at Auvisys. 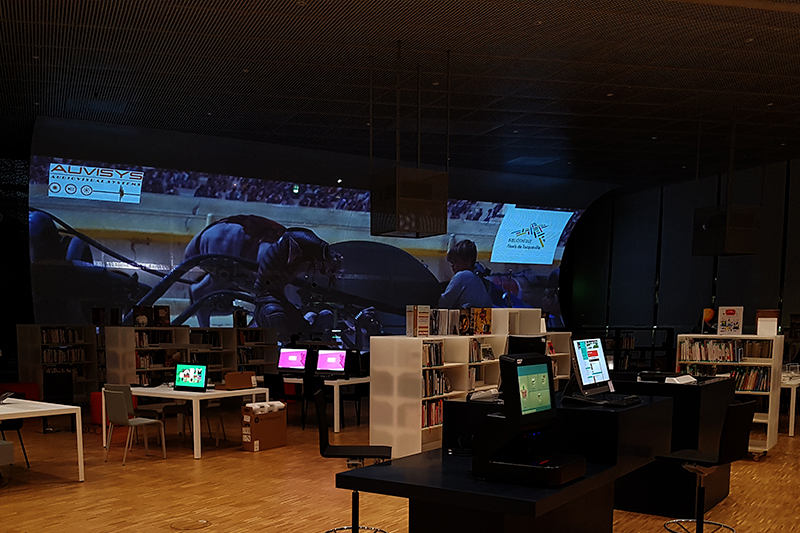 At the heart of the library, the Science & Technologies centre welcomes visitors with an impressive semi-cylindrical video fresco. This particular part of the project presented challenges due to the size of the projection surface (22m x 5m) and the ambient light in the room which is made of glass. Auvisys opted for two ceiling mounted 3-Chip DLP HIGHlite projectors from Digital Projection, to project a striking panoramic image. This series of projectors was selected for its high resolution, image quality, brightness and low maintenance thanks to the laser source. 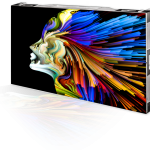 Content is managed by a Modulo Pi media server, allowing for perfect uniformity due to its warping and blending functions. Laser technology is perfectly suited for image blending because of the uniformity in the whites it offers” he adds. 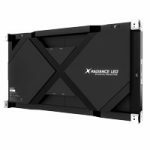 This technology also reduces added costs for lamps, regular maintenance of the products and the need to calibrate the video projection every time an action is required. 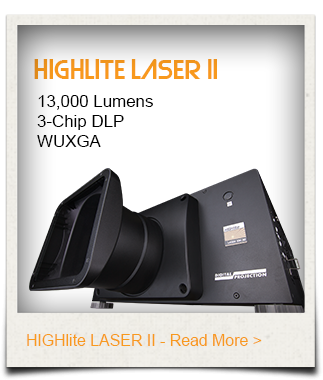 In the new 150-seater auditorium, Auvisys also selected a projector from the HIGHlite series. 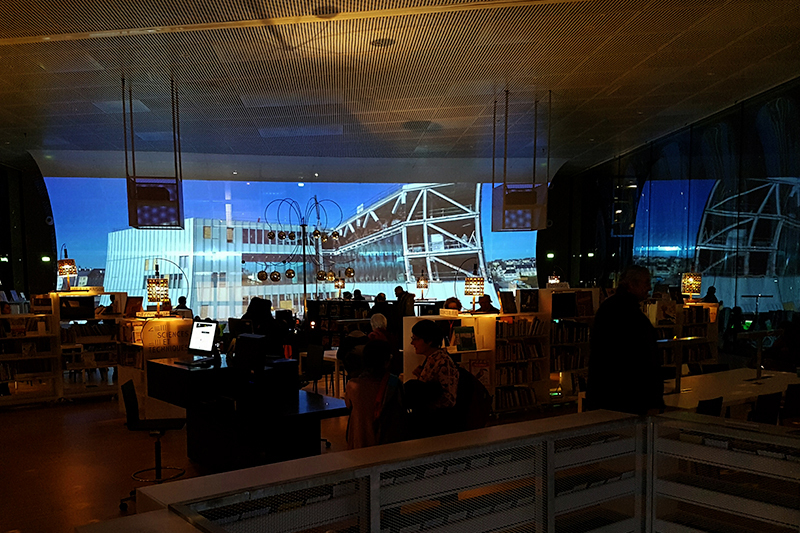 Installed on a motorised platform situated at the back of the auditorium, the projector feeds a retractable screen measuring eight metres long by seven metres wide. The projector is HDBaseT fed, using an Extron DTP system linked to various sources (Blu-ray player, computer, etc.). “It was particularly important for us to respect the characteristics of this space which is very transparent” explains Amélie Chassériaux, project manager for dUCKS scéno. The AV equipment is hanging from the ceiling in order to allow for the glass facade to be free from any technical element.” A motorised curtain with sound and blackout properties was fitted to isolate the auditorium from the outside. Conferences and presentations can be streamed live across the building as well as on the Caen city YouTube channel. A Dante audio network allows for the auditorium conferences to be broadcasted in the entire library thanks to broadcasting modules. Furniture available on free access is also equipped with a screen and a sound system, while a console invites visitors to watch movies and various multimedia content.